A rainbow crossing previously installed in Sydney in 2013 is set to make a comeback for the 40th anniversary of the Mardi Gras festival. 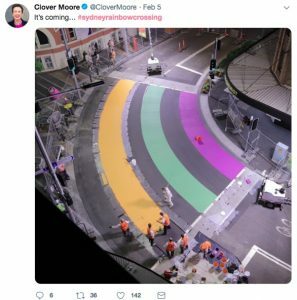 But, now, Sydney Lord Mayor Clover Moore has teased Twitter users with the return of the rainbow crossing in a nearby location on the corner of Bourke and Campbell streets near Taylor Square. 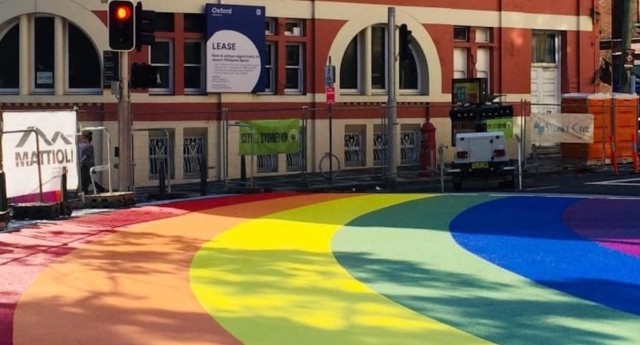 The rainbow crossing is set to be unveiled on Saturday, February 9, as part of the festivities for the Mardi Gras festival, which runs from February 15 to March 3 in the Oxford Street area of the city. The previous crossing, which was installed on a one-month trial basis, was covered over with tarmac during the night by the state government, after a feud with Sydney City Council. In June 2018, Moore confirmed that the rainbow crossing would be re-installed, saying that it was “incredibly significant” to the LGBT+ community. “It was devastating when it was removed with no warning in the middle of the night,” she told ABC News at the time. The new crossing will be trialled for six months. It will then be decided by the city council whether it will be allowed to remain permanently near Taylor Square. The mayor said she believed the crossing will be deemed safe by authorities. “I would rather it just went in and was permanent, but we’ll do that trial and I’m very confident it will pass with flying rainbow colours,” said Moore.